What is that Plantar Fasciitis? I treat many patients with Plantar Fasciitis especially at this time of the year. Warm weather is perfect for hiking, gardening, walking and running and very many people find themselves unable to do activities they love because of stabbing heel pain. They come to see me and I explain to them that they suffer from Plantar Fascia Inflammation or Plantar Fasciitis. Plantar Fasciitis is Inflammation of this connective tissue on the bottom of the foot and it is one of the most common causes of foot and heel pain. Plantar Fascia is a very important connective tissue structure since it connects your toes, heel and calf via Achilles and serves as a shock absorber with walking and running. In people who have Plantar Fasciitis this connective tissue is too tight, irritated, and inflamed causing increased pull and in some cases the body responds with creating a bone spur to reinforce the strength of the area. This is unfortunately a poor strategy because bone spurs create stabbing pain with weight bearing. Most of my patients with Plantar Fasciitis are experiencing stabbing pain with the first step in the morning since the tissue is very tight after waking up and gets better during the day as your foot limbers up. Plantar fasciitis is more common for people over 40 years of age, runners, dancers, overweight, people who are flatfooted, and these who spend prolonged periods of time on their feet such us factory workers. Some of my patients had history of ankle injury and few of them had a fall that caused leg length discrepancy making them prone to plantar fasciitis on one side. Plantar Fasciitis will not resolve on its own and it can further impair your functional mobility and overall health by progressing to tears or chronic pain. Furthermore, Plantar Fasciitis can cause knee, hip or back problems due to asymmetric weight bearing and limping. Physical therapy. A skillful physical therapist will make a big difference by treating painful symptoms of Plantar Fasciitis as well as root cause of the problem (tissue tightness, faulty ankle mechanics, and LE weakness). Comprehensive Physical Therapy treatment will consist of deep tissue release, stretching, functional movement and strengthening as well as modalities such us cold laser for pain and inflammation control. Night splints. Very many patients ask about wearing a splint that stretches your calf and the arch of the foot while asleep to prevent stabbing pain with the first step in the morning. I still have to find a design I like to recommend to my patients since most of them either do not work or are too bulky to sleep in. Orthotics. Good arch support is very important to help with even distribution of weight and preventing rolling the foot in in case of foot pronation. They can be and it can be obtained of-the-shelf or custom-made. Foot wear. Foot wear has to have good arch and heel support. Shoes have to be evaluated since every single person had different needs and benefits from different type of footwear and different kind of support. If you run, you have to change your shoes frequently (every 6 months) not to allow wear and tear and loss of support. Cold Laser. Cold Laser makes a big difference in treatment of Plantar Fasciitis. It speeds up healing, controls inflammation, improves elasticity of collagen tissue, provides fast pain relieve and can make a difference in between limping and pain free walking in just couple of minutes. 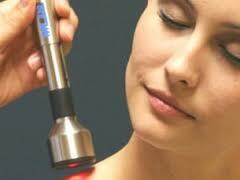 I recommend use of Cold Laser to all of my Plantar Fasciitis patients. Stretching of the foot and ankle is very helpful and it should be done frequently throughout the day to alleviate tightens. The stretch should be done with both knees bent and the knee straight to target all muscle groups in the foot and calf. Icing of the plantar fascia helps with inflammation and pain and should be performed for 20 min several times per day. If this does not help, you should seek help of a Physical Therapist to receive comprehensive treatment. Check out how this patient overcame her severe and prolonged Plantar Fasciitis pain! Lilly Physical Therapy strives to achieve pain relief for every patient with the most effective and efficient techniques. Call today to start your journey to a better self!